Yggdrasil, the heart of Norse mythology, is the name of the great, cosmic tree that supports all the nine realms. If it should ever fall, then the all those worlds will fall as well. 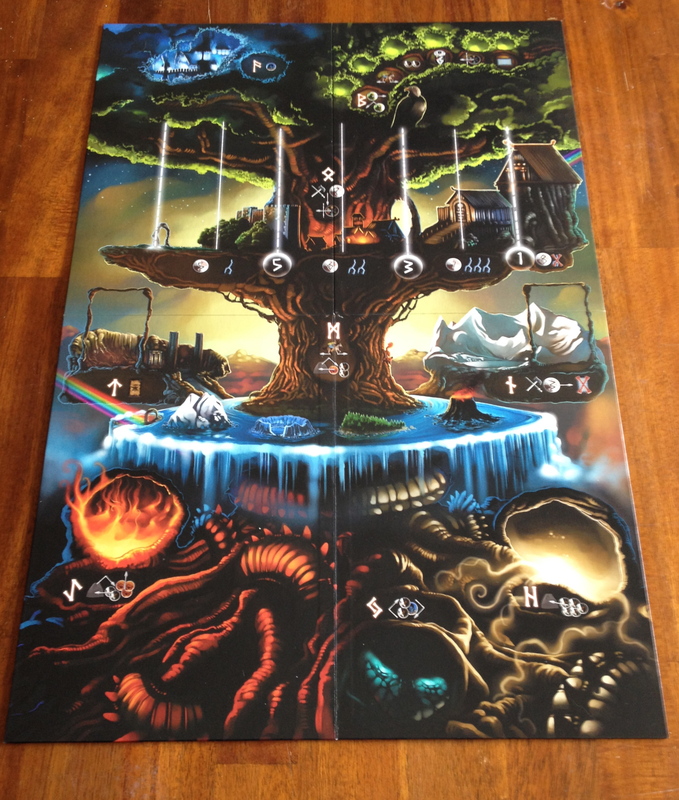 In Yggdrasil, your roles as heroes, and the villains who stand in your way, are all pulled directly from this mythos. You must beat back the dark forces that threaten all of our worlds! 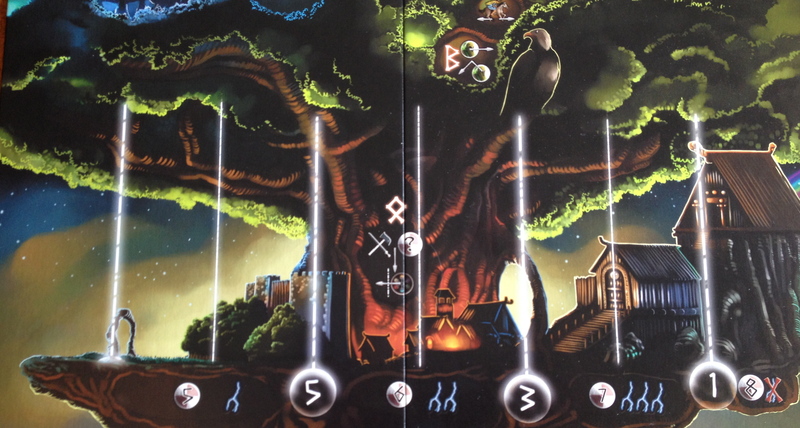 Yggdrasil is a cooperative game for 1-6 players. You play the role of a god. Along with the other gods, you must stop the advancing evil forces of Nidhogg, Surt, Jormungand, Fenrir, Hel, and Loki from destroying the fabled world tree. The forces that are working against you! 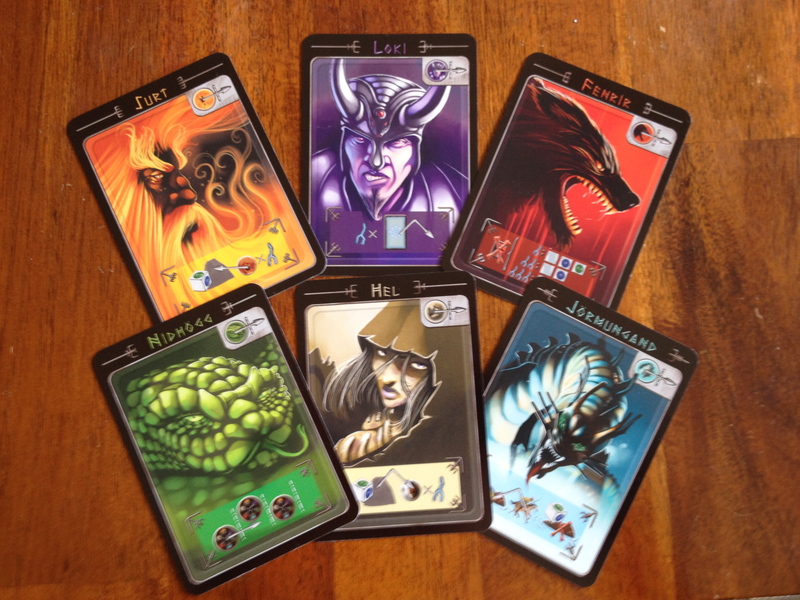 In order to beat back Loki and his forces, your turn is played in two stages: Take an enemy card (move its counter forward and apply its effect) and perform three different actions by heading to different places on the board. In Asgard – Attack one of the forces of evil. In Midgard – Move the Valkyries up an island or look for viking souls (in the island bag that the valkyries are on) to help in the fight. In the Dwarven Forge – Take or upgrade any artifact that will give you bonuses. Where all the cool elves hang out! In the World of the Elves – Take an elf to aid you. In the World of Darkness – Exchange elves or viking souls with another god. In the World of the Dead – Take 5 viking souls and add them to the island bag of your choice. In the Kingdom of Fire – Take 5 counters from an island bag and remove all fire giants you find. 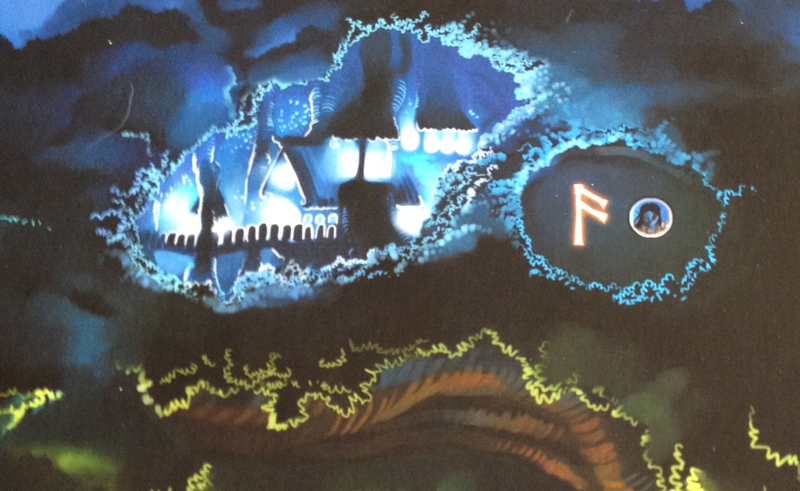 In the Ice Fortress – Fight the active frost giant. If you win, its negative effect goes away. In the Sacred Land – Move Vanir forward or back to the beginning. His spaces help you in battle. Don’t let evil get too far ahead, or your defeat is assured. The players are defeated when there are five enemies or more beyond the wall of Asgard, three or more enemies beyond the doors of Valhalla, or there is one enemy in Odin’s residence. If none of these conditions have taken place and you run out of enemy cards, you have beaten the forces of darkness and win the game! The Loki to Success, or You’ll be Thor Tomorrow? 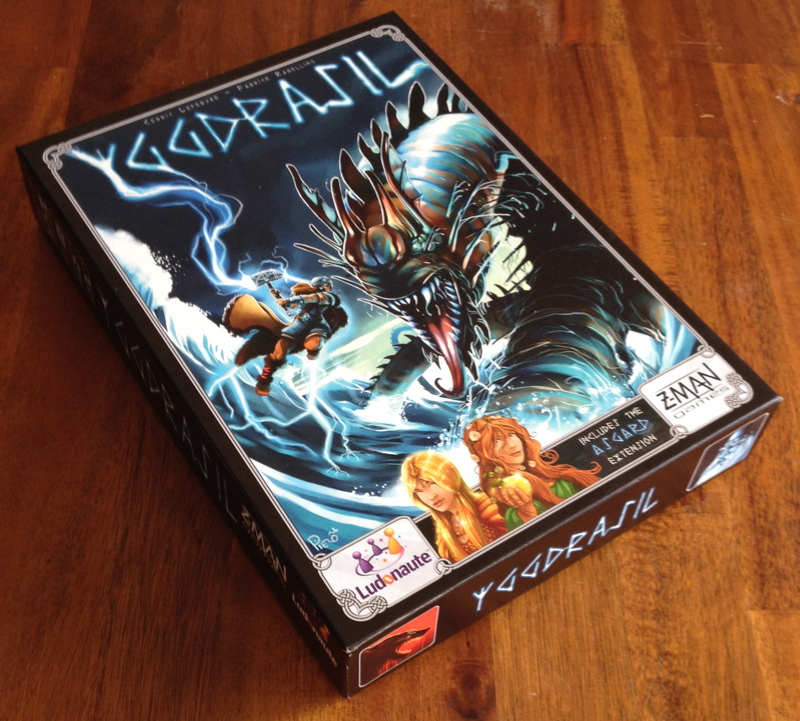 Yggdrasil is a wonderful cooperative, risk management game that seamlessly weaves a story based on Norse mythology into the game play. This, along with its beautiful components, creates a solid gaming experience. Play as Thor or Freyja. Or as both! Each playable god or goddess in Yggdrasil has their own unique power that relates to who they are. It helps to tie in the roles you can play to the theme of the game. Thor has a permanent combat bonus; Odin can pick up two enemy cards, choose one to fight, and put the other on top or the bottom of the deck; and Freyja can perform two of her three actions in the same world. My only complaint about the playable characters is that in the main game, there is only one goddess. However, my copy of the base game also included the Asgard expansion, which bumps that number up to four: Freyja, Frigg, Sif, and Idunn. Move the Valkyries across the islands. Overall the theme is well implemented and rich. I felt truly immersed in the world. Norse mythology is a hobby of mine, so when I discovered that this game was steeped in it, I couldn’t resist. The game designers showed that they cared about the source material and wanted to make a game that would bring all the elements of various tales together. Risk management is the main mechanic you will find in this game. You need to take your time to prepare for combat. It will help increase your chances of success if you concentrate on gaining weapons and allies. But your enemies will become more powerful as they advance. If you wait too long to strengthen your position, they will become more of a challenge than you can hope to overcome. I found that you need to find a good balance between fighting back the enemies and gaining bonuses. Too much time spent on one aspect or the other will lead to an early defeat. One of my games ended too quickly due to poor management. Even though we had lots of allies and our gods were strong, the enemies were too close to their victory for us to defeat them. Chance is also a factor that you have to overcome in order to win. There are a lot of dice rolls involved, and a poor roll can make or break you. It is frustrating, but I also feel that it works well with the theme. It is a war of gods against evil, and in war, there are always random elements. Can you defeat the power of Loki and his crew? Difficulty can vary depending on how many players you have and what skill level those players are at. 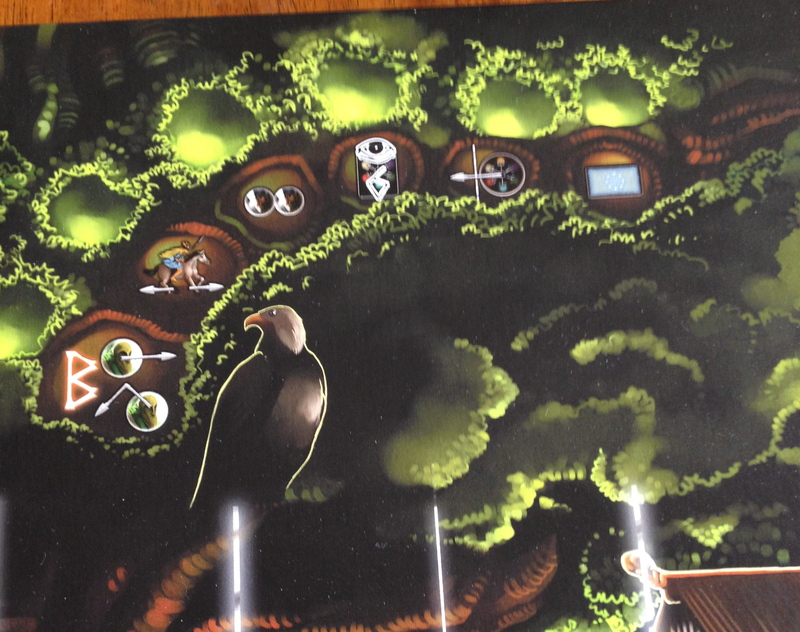 In the initial set up how many elves you receive is dependent on the number of players. This leaves you with fewer allies if you have fewer people involved. Angry enemy cards (1 to 6) and Ragnarok cards (1 to 4) can be added in differing amounts to the deck as well to make things harder. Since each god has a different power, this will also vary the difficulty of the game according to which gods are present and what their turn order is. All these options to increase and decrease the skill level required, giving the game amazing amounts of replayability. However, even on the easiest level, this game is extremely difficult. Expect more losses than wins with this one. I found that in-game player interaction is lacking in Yggdrasil as it feels more like a multiplayer solitaire game than a true cooperative. Since it can be played solo, this makes some sense. But I have played quite a few other games with one (or more) player counts that are cooperative and have high interaction as the number of players increases, so this isn’t an excuse. I feel that this game could have been made more interactive by giving the players more abilities to buff one another or to trade items among themselves. The only interaction you find is when trading viking souls, the rest is pretty much played on your own. Viking souls and Fire giants! Oh my! This does not mean that discussions don’t take place among the players regarding strategy. There is a lot of decision making going on throughout the game, and if you don’t discuss them with your teammates, then there is a chance that turns can be wasted. If someone is in a better position to gather souls, then you shouldn’t do that as well. Because of these discussions, there can be analysis paralysis issues that interrupt the overall flow of the game. It causes the game to be less dynamic, and makes it feel sluggish. 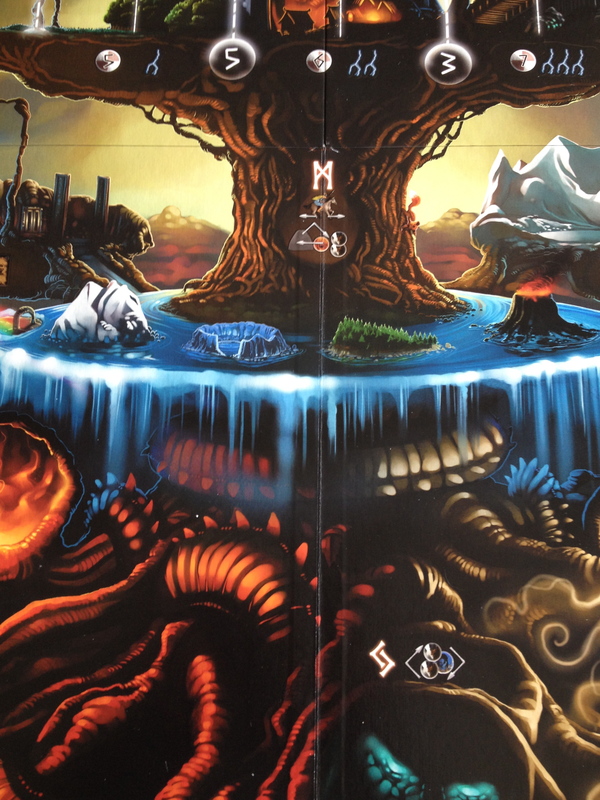 Gorgeous is the only way to describe the artwork and components of Yggdrasil. The artwork is beautiful and really pulls the theme through all the pieces. The colors are rich and vibrant, and just looking at this game evokes feelings of depth and beauty. Everything involved is stunning. The board’s artwork blends all the individual spaces seamlessly together so that it looks like a whole picture, but it is intuitive enough that you know where each space is and what it is for. All cards are made of good quality cardstock and shuffle well. I have played this game many times and the cards edges still have no marks on them. My only dislike is the bags. 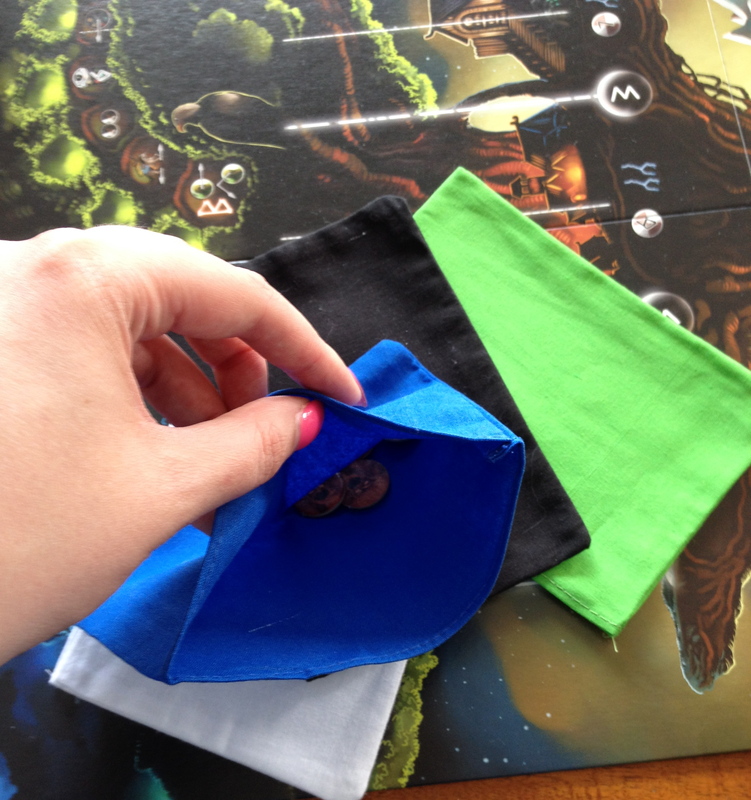 They are cloth, which is great and better than most bags that come in games, but they have one side completely open. When reaching for them to grab the cardboard disks, I would inevitably, at least once, spill its contents everywhere. A drawstring would have been very welcome in this case. It is a relatively minor complaint though. Love the cloth, hate the opening. 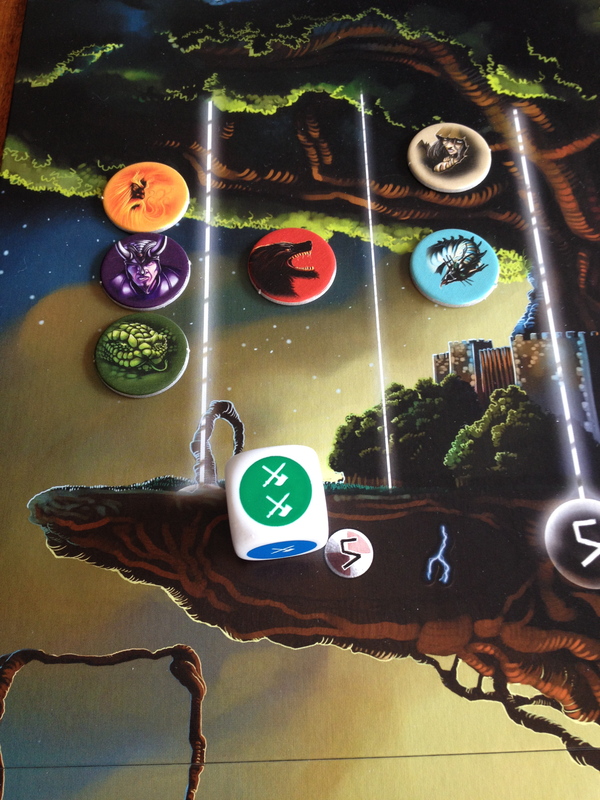 Yggdrasil‘s systems create unique and interesting possibilities that mesh well with its mechanics. It relies on controlling probability and is dependent on good dice rolls. However, it does maintain its analytical aspect. It is a solid game that is as beautiful as it is brutal. Victory is difficult to pull off, but when you do, the sense of satisfaction you will get is more than worth it. Beautiful artwork and seamless integration of the components. Satisfyingly difficult with varying levels of skill required. Can be too difficult for some, even on the easiest level. Discussion can interrupt the flow of the game. Analysis paralysis can cause the game to be longer than necessary.